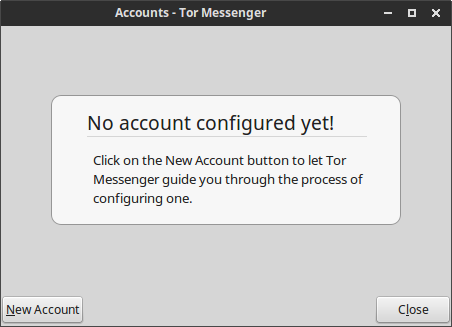 There is currently a bug with Tor Messenger where it will not attempt to fetch the SRV records and translate “xmpp.is” into “prosody.xmpp.is” so this guide contains a work-around for you to use xmpp.is on Tor Messenger. 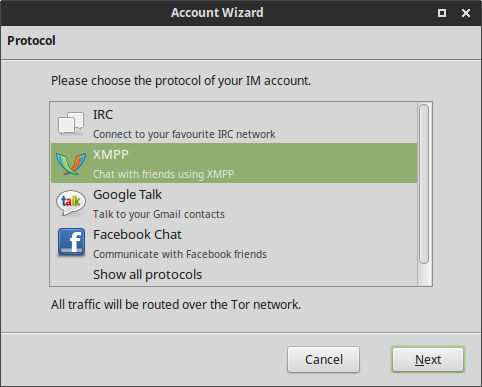 Until that bug is fixed you must use this work-around to register & connect to xmpp.is. When you get it running you will see this screen. Press “New Account” and a new window will appear. 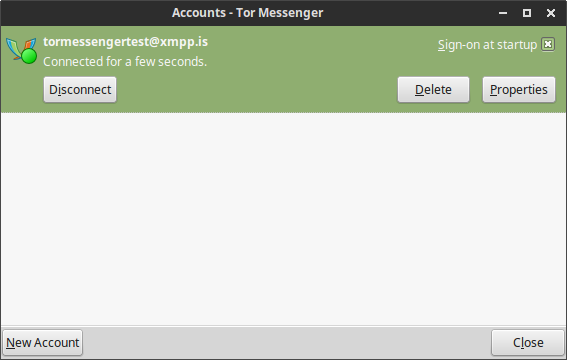 Select “XMPP” and press “Next”. 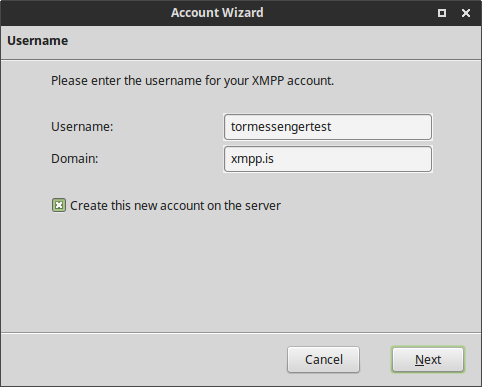 Here you will see how you should register specify any username you’d like but make sure the domain is set to “xmpp.is” and that the “Create this new account on the server” is checked. Once you do that press “Next”. 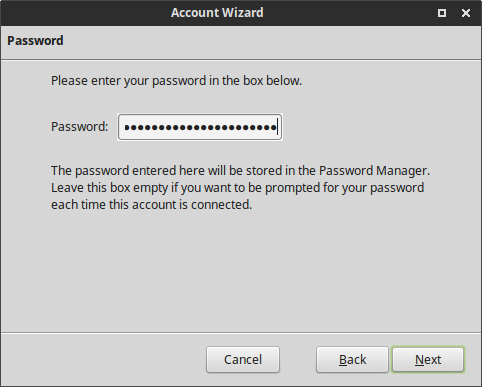 Now enter a password (make it strong!) then press “Next”. This is the important part that involves the work-around. 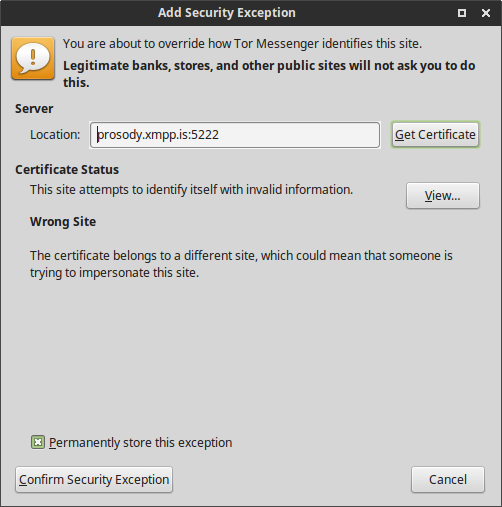 Since Tor Messenger doesn’t currently fetch the SRV records you must specify the server to be “prosody.xmpp.is”. Everything else can be left as is, then press “Next”. You will now confirm the details before you register, then finally press “Finish”. Now the account has been added to your client but not registered yet. It will throw this error message. To make it work you must press “Add Exception”. 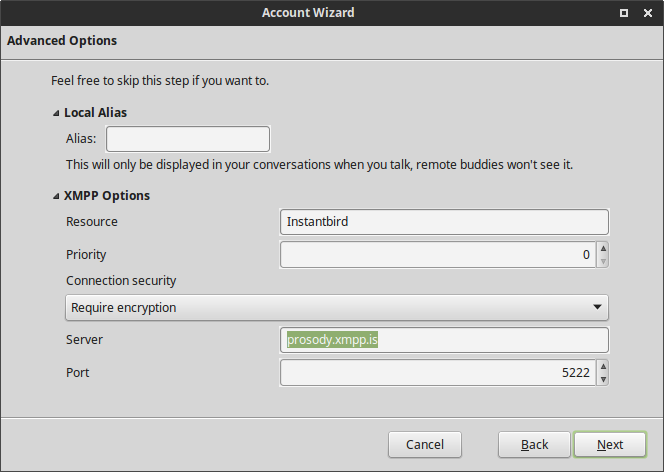 There is no security issue with this, it is only complaining because it expects the certificate to have “prosody.xmpp.is” as the CN instead of “xmpp.is”. After confirming it will ask you to enter the password again to complete the registration, then press “OK”. You’re now done! It should take a few seconds to register and connect. Then start chatting securely!